Success can be both a blessing and a curse. While a well-received build can put a custom shop on the map, it can just as easily lock them into a certain style. Not ideal in an industry where progression is key. This is the position that Jose and Tito of Maccomotors found themselves in not too long ago. A previous Bonneville they’d built—dubbed Dusty Pearl—had garnered such interest that they were receiving numerous requests for a remake. One such brief came from a client in London, but the Spanish duo “believe that every bike must be unique and exclusive.” So they convinced their client to let them build something in a similar vein, but different. 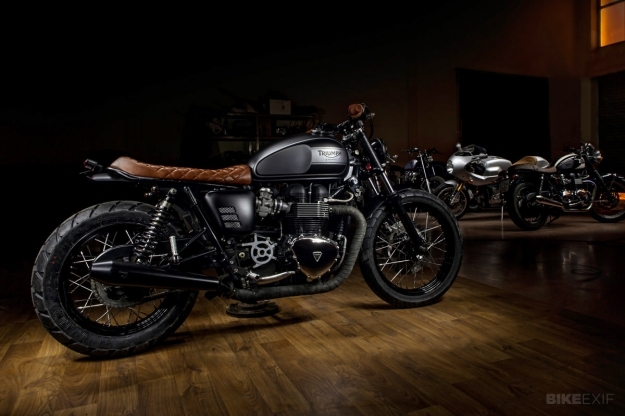 In the Málaga workshop, the Bonneville T100’s tank was redone in a matte black and raw metal scheme—designed to emphasize its muscularity. 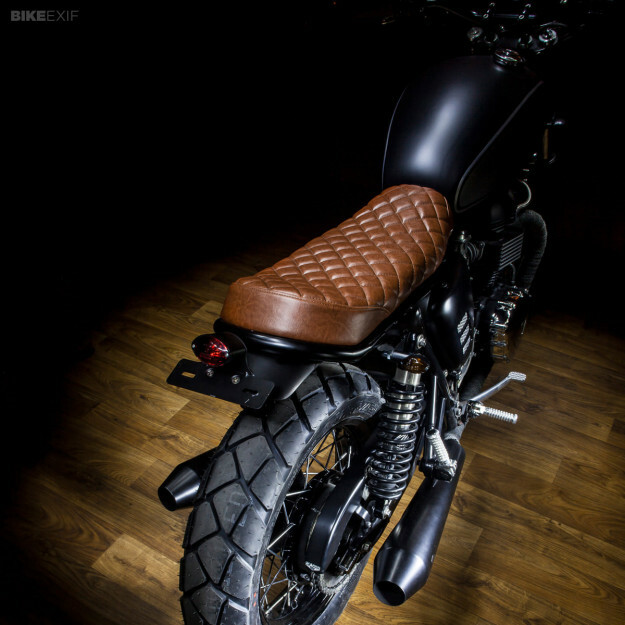 Macco shortened and looped the subframe, adding a custom-made, two-up brown synthetic leather seat. 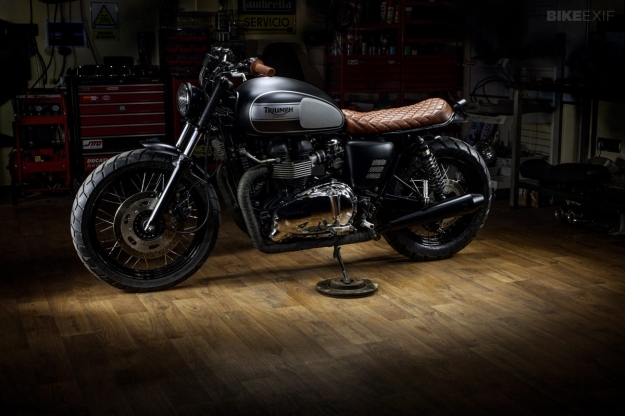 A Thruxton rear fender was bobbed and fitted, and a fiberglass front fender manufactured in-house. Macco modified the stock side covers with mesh-lined cutouts, but left the original chromed engine covers untouched—as they liked the look and considered them a distinguishing feature of the Bonneville T100. 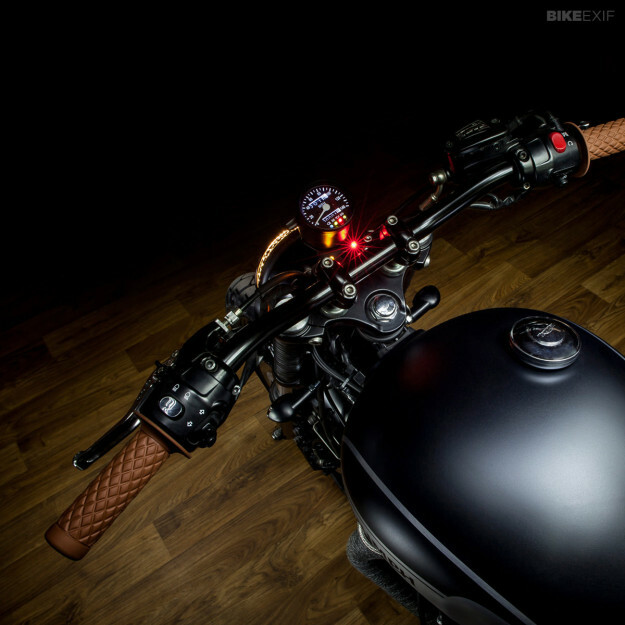 Up front, 1” Biltwell Tracker bars were fitted, along with Biltwell Thruster grips, racing-style levers and a mini-speedo. 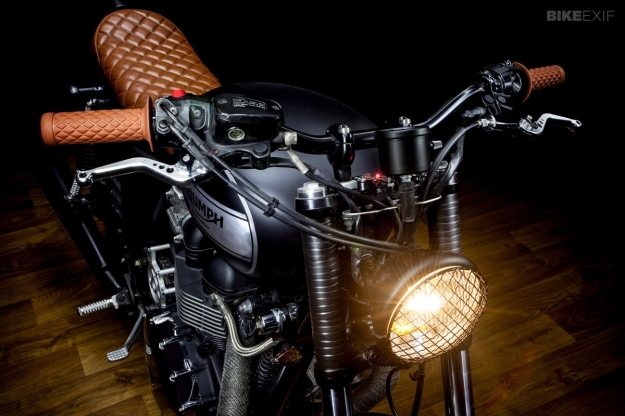 The headlight is a Bates unit, with a grill borrowed from a Triumph TR6 (of the four-wheeled variety). Hagon Nitro shocks (rear) and progressive springs (front) make for a smoother ride, and the wheels are now wrapped in Metzeler Tourance tires—designed for light dual-sport use with a clear bias towards tarmac. 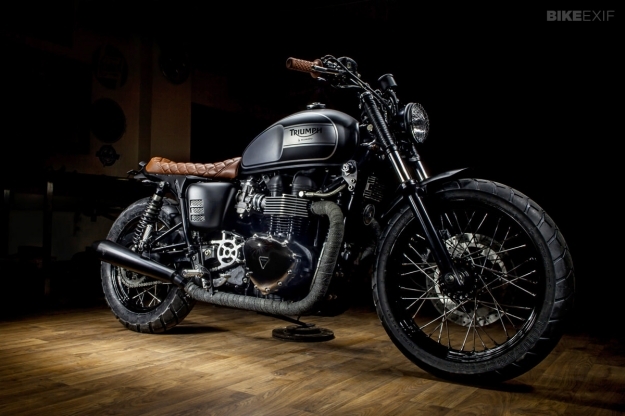 K&N filters and blacked-out British Customs Predator exhausts help the T100 breathe a little easier. Other bits include a LSL sprocket cover, mini turn signals and taillight, and alloy foot pegs. While it might share Dusty Pearl’s genes, The Lizard King (as Macco have named it) is unique enough to keep both its owner and its creators happy. All that remains to be seen now is: how many customers will ask Jose and Tito to build another one? Photos by Sergio Ibarra. Check out Maccomotors’ other bikes on their new website, and keep in touch via the Maccomotors Facebook page.